Let me start of by admitting that until Myke from the Pen Addict Podcast started his own personal quest to own every style of Retro 51 Tornado made I had never heard of this pen. After some digging around via good old friend google and twitter I stumbled upon a UK dealer for the Retro51 range. I went the predictable route and purchased the Stealth model for £25. That was roughly a year ago and I think this is a must have purchase for any pen addict out there. Let me get down to explaining why. To start off, it comes in an insane amount of styles (just ask Myke!) and to produce or retract the nib it uses a pretty unique twist mechanism. This is located at the top of the barrel and it has to be the smoothest mechanism I have ever used. There is a strangely satisfying locking in to place feeling when the nib is locked into writing position. The barrel is very well built and has a good weight to it, but at the same time feels very balanced. There is a standard metal clip that will help keep it in place when in a case or pocket. 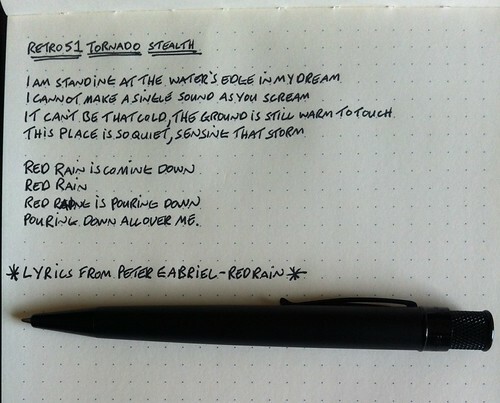 One thing I have come across every so often is that I get a random clicking sound/feedback from the Tornado as I write. I think it is the nib of the refill tapping the tip of the barrel, anyone else come across this? One of the biggest factors that makes this a wonderful pen is the refill it uses. It uses a Schmidt Rollerball which not only produces a wonderful strength and consistent depth of colour but also produces one of the smoothest writing experiences I have ever come across. I am so glad I did purchase one and I really recommend you give one a try. One surprise I won’t ruin for you is the quality of the packaging the Retro51 Tornado comes in. The only way you will find out is to buy one!